Fuentes-Rein�s, J. M., Zoppi de Roa, E. & Torres, R. A new species of Cletocamptus Schmankewitsch, 1875 (Crustacea, Copepoda, Harpacticoida) and the description of the male of C. nudus from Colombia. 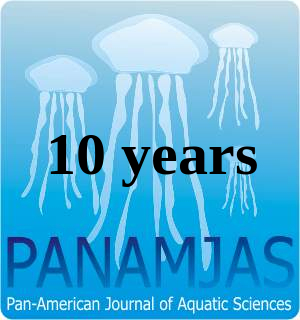 Pan-American Journal of Aquatic Sciences, 10(1): 1-18. Download PDF file (2,835 Kb). Paiva, M. I. G., Mendes, L. F., Lins-Oliveira, J. E., Alencar, C. E. R. D. & Torquato, F. O. Temporal and spatial patterns on the settlement of reef fish larvae in a South Atlantic reef, Bahia, Brazil. Pan-American Journal of Aquatic Sciences, 10(1): 19-28. Download PDF file (577 Kb). Espinosa, M. A. & Isla, F. I. Modern diatom assemblages in surface sediments from meso-macrotidal estuaries of Patagonia, Argentina . Pan-American Journal of Aquatic Sciences, 10(1): 29-43. Download PDF file (382 Kb). Ferreira Jr., A. L., Bot Neto, R. L., Kolm, H. E. & Absher, T. M. Relationship between reproductive cycle of Anomalocardia brasiliana (Mollusca: Veneridae) and the suspended particulate matter in the Paranagu� Estuarine Complex, Brazil. Pan-American Journal of Aquatic Sciences, 10(1): 44-54. Download PDF file (619 Kb). Panelo, L., Panzeri, A. M., Del Valle, J. C. & L�pez Ma�anes, A. A. Integrative study at the biochemical level in a intertidal crab from Mar Chiquita coastal lagoon (Buenos Aires, Argentina) upon acute exposure to high zinc. Pan-American Journal of Aquatic Sciences, 10(1): 55-67. Download PDF file (637 Kb). P�rez, C. D., Farrapeira, C. M., Lima, S. T. & Cordeiro, R. T. Is the octocoral Erythropodium caribaeorum (Cnidaria: Anthozoa) a folkloric species from Brazil?. Pan-American Journal of Aquatic Sciences, 10(1): 68-75. Download PDF file (2,327 Kb). Mugnai, R. & Serpa-Filho, A. A new proposal for the optimization of morphological analyses of micro and macroinvertebrates in ecological freshwater studies. Pan-American Journal of Aquatic Sciences, 10(1): 76-79. Download PDF file (877 Kb). Marques, S. & Barreiros, J. P. Opportunistic feeding behavior of Diplodus argenteus (Perciformes, Sparidae): human-fish interaction in two rocky reefs from SE and S Brazil. Pan-American Journal of Aquatic Sciences, 10(1): 80-83. Download PDF file (2,966 Kb). Correa Cardozo, P., Acu�a Plavan, A., Lercari Bernier, D. & Gurdel Bas, R. Food consumption rates in fishes of the R�o de la Plata and southwest Atlantic coast (Uruguay). Pan-American Journal of Aquatic Sciences, 10(1): 84-88. Download PDF file (662 Kb). Clemente, J., Iglesias, C., Kr�ger, A., Lagomarsino, J. J., M�ndez, G., Marroni, S. & Mazzeo, N First record of the golden mussel Limnoperna fortunei Dunker, 1857 (Bivalvia: Mytilidae) in a lentic system in Uruguay. Pan-American Journal of Aquatic Sciences, 10(1): 89-93. Download PDF file (627 Kb).